"No one ever understood disaster until it came," wrote Josephine Herbst in Nothing Is Sacred. Sadly, people who are now facing hurricane inundations, wildfires, and earthquakes know that feeling of having what you cherish ripped away. Whether it's a loved one, your property, or your sense of security that's gone, the loss is real and searing. People in times gone by could chalk up natural disasters to the stars: The word comes from the Latin dis- (negation) + astrum ("star") — an ill-fated star. But we do not have that luxury, given the science of climate change. We cannot say exactly to what extent global warming is contributing to current disasters, but we can say for sure that continuing on our current path is perilous. Our response to the disasters needs to be two-fold: compassionately and wisely addressing the immediate crisis — as the "Cajun Navy," the Red Cross, and others of good heart have been doing — and taking a freshly sober look at the big picture. We are not lacking for knowledge about how to live in greater harmony with the earth, but we are pinned in place by old habits. Prayerfully carry with you the riddle, "What can I do?" -- bearing in mind that sometimes the answer will be "less." Let the question permeate your observations and decisions, so that we can at least inch closer to being good stewards of each other and the Earth. 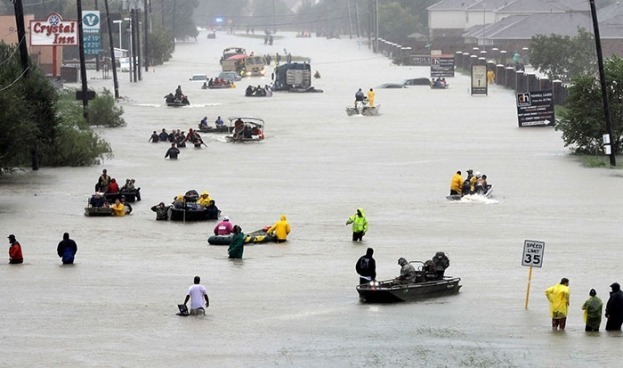 Second, as you watch or hear news reports about the flooding and other natural disasters, make a practice of repeating this flash prayer: "God be with those in trouble and with those arriving to help."